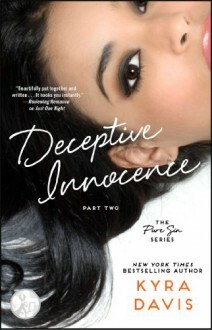 Part 2 of Deceptive Innocence—the first book in the sensual, thrilling Pure Sin trilogy by New York Times bestselling author Kyra Davis (Just One Night). A beautiful young woman is out for revenge—only to find the man she’s targeting has secrets as dangerous as her own, and a passion she cannot resist.Ever since her mother died while serving time for a murder she didn’t commit, Bell has been focused on one thing: revenge. She knows her mother was set up by the head of the powerful Gable family, international bankers who will crush anyone for profit, or amusement. Now she’s determined to take the Gables down—from the inside. Seducing her way into the life—and bed—of the family's rebellious youngest son, Lander, she figures it should be easy to uncover the secrets she needs to destroy the Gables. But Lander turns out to be much more complicated than Bell ever could have imagined. He’s enticing, intelligent, mysterious—and their sexual chemistry is off the charts. Lander is still the target, but when he touches her, he starts seeming much less like an enemy… Which is why her anger is so necessary: memories of her mother must help fuel her quest for justice to the very end.